This airbrush make-up kit is for professional mobile, home or student use with your preferred brand of airbrush-ready or suitably-thinned makeup. The Iwata Revolution CR airbrush, with its 0.5mm nozzle, offers you the renowned professional quality of Iwata at a competitive price. 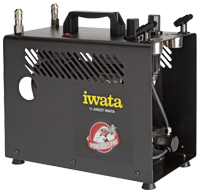 The Iwata Silver Jet compressor is attractive, compact and lightweight - ideal for the mobile professional. This manual compressor has a pressure gauge and pressure adjustment knob. This kit also includes two cleaners. The Revolution CR airbrush is also suitable for body art. Cleaning the airbrush is important anyway, but even more so when switching between products with different bases, such as water-based, alcohol-based or silicon-based. Ideally we recommend an airbrush dedicated to each type of product. 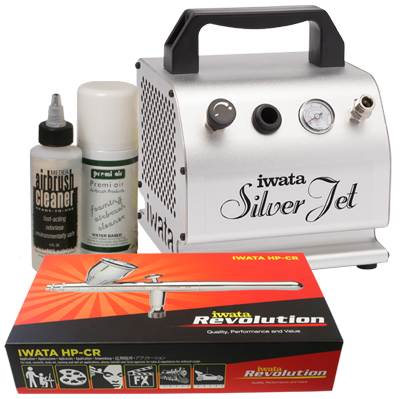 The Silver Jet compressor is also suitable for running an airbrush for other mobile beauty applications, tanning, nail art or body art. The compressor is not suitable for heavier salon use. If you need a compressor for heavier use, please click here to view all other make-up kits.